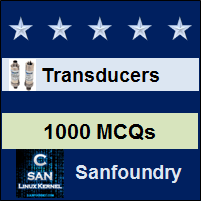 This set of Instrumentation Transducers Multiple Choice Questions & Answers (MCQs) focuses on “Standard Test Signals”. 1. Which of the following represents Laplace transform of ramp signal? Explanation: Ramp function is given as r (t) = t for all t >0. Its Laplace transform gives 1⁄S2. What does this function represents? Explanation: Given diagram represents a step function, which is shifted to right by two units and can write as u(t-2). 3. Laplace transform function f (t) is F(S), then how will you represent Laplace transform for differential of f (t)? Explanation: This is obtained by time differential property of Laplace transform. 4. How will you obtain given function from unit step signals? Explanation: Given expression cancels common region in two functions, and the remaining will be function of our interest. u(t+1) is step signal with one unit left shifted, and u(t-1) is step signal with one unit right shifted. 5. How will you represent given function? 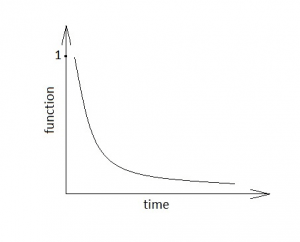 Explanation: Given function is a decreasing exponential with initial amplitude one, where u(t) represents step function. u(t) gives initial amplitude and negative power of exponential gives a negative slop to function. 6. Which of the following function is represented using given condition? 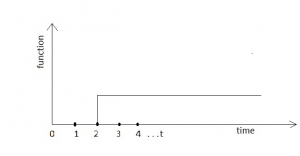 Explanation: Impulse signal has a value only at t=0 and has zero value otherwise. Unit impulse function will have amplitude one at time t=0. 7. What is the result of the expression f(t)= u (t+2) – u (t-3)? Explanation: u (t) is step function, and subtracting two shifted step functions will cancel their common region and produces new function. u(t+2) is a step signal with two units shifted left side and u(t-3) is a step signal with three units shifted right side. Explanation: Transfer function is ratio of Output to Input and hence Output can be obtained as a product of transfer function and input, which gives 1/S2. For a positive sided signal using inverse Laplace transform, output is obtained as ramp signal. 9. Function f (t) has Laplace transform F(S). How will you represent Laplace transform of integral of f(t)? Explanation: This is obtained by integration property of Laplace transform. 10. Which of the following represents Laplace transform of sinh(at)? Explanation: Given function represents hyperbolic sine function. Hyperbolic sine function can be represented as sinhx= (ex-e-x)⁄2. Applying Laplace transform equation to this expression, we obtain Laplace transform of hyperbolic sine function.